I stopped to see my friend, Heidi Johannsen Stewart, and one of her three partners, Michael Shannon, tea proprietors of the wildly gorgeous and successful line of artisan teas Bellocq at the New Amsterdam Market last Sunday. I picked up three of their irresistable teas. No. 18, Afghani Chai, a black assam tea with organic red poppy flowers, green cardamon, star anise, ginger, clove and black pepper. It had been on my mind since a cold winter day at the market when they were handing out samples. I had become somewhat obsessed with it. I also picked up what they were calling their "summertime chai", a little lighter than the Afghani Chaiand caffeine free. It is called Hindu Holiday. 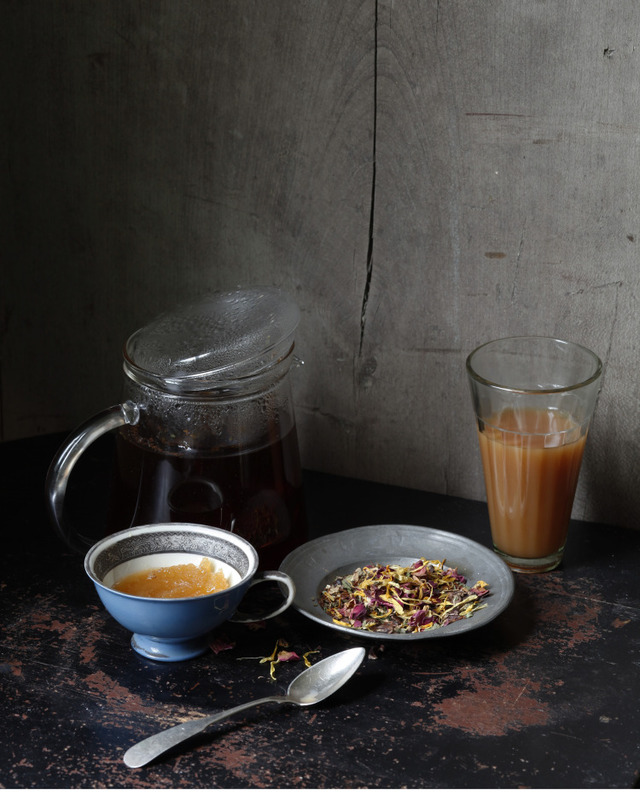 It is a rooibos based chai, caffeine free with cardamom, fragrant cassia, spicy ginger rose, jasmine and marigold petals. I was, however, most intrigued by the tea called Little Dickens. Little Dickens, was lovingly created by Heidi and her son. It is full of all kinds of things that kids love. Like Hindu Holiday, it too is rooibos based and caffeine free. A few of the ingredients in Little Dickens are ginger, cinnamon, mint, chocolate, marigold and a little rose. Steep it, then add a little milk and honey. Hiedi feels that scent and flavor not only bring back forgotten memories, but that they also enrich the present. "Great teas can be powerful conduit to unite life's precious moments." I couldn't agree more. Many of my strongest memories are attached to taste and smell. So I decided to pick up some tea to share with my sweet little friend Odette, who just became a big sister this past week. Odette is no stranger to tea drinking, but part of me just wants to hear her tell me all about Little Dickens and what is in it. She is at the amazing, curious and talkative age of three. Having her own tea, like her mom does, will make her feel very grown up. It will be a nice way to make her feel special in these new and sometimes confusing post baby days. I am upstate and all is quiet except for the crazy morning birds. I think it is the perfect moment to sit on the porch and have a cup of tea. Look for Belloq's new atelier at 37 Greenpoint Avenue in Brooklyn, coming very soon! Bellocq's founders, Heidi Johannsen Stewart, Michael Shannon, Young Yoon and Scott Stewart joined creative forces with a desire to collaborate on a shared aesthetic vision, an appreciation of traditional artisan production and a passion for tea.